Minneapolis, Minnesota is one of the largest and most dynamic cities in the American Midwest. It's also the hometown of AirVuz, which produced this brief history of the city told largely with drone footage. The video tells the story of the city's origins as a flour milling center on the Mississippi River to its growth as a large corporate center to its most recent transformation, which has been driven in large part by the construction of numerous world-class sports venues in and around the downtown area. Description: With its hometown of Minneapolis hosting Super Bowl LII on February 4, 2018, AirVūz wanted to do something to show off the city. Last year, AirVuz produced a mini-documentary called Minneapolis History: The Aerial Experience. However, the story told in this video was largely about the Minneapolis of the 19th and 20th centuries. 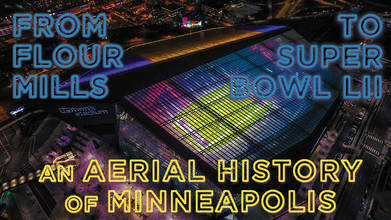 Given the center stage afforded to Minneapolis by hosting its second Super Bowl, AirVūz decided to update its history and emphasize the transformation that downtown Minneapolis has undergone thus far in the 21st century. This being AirVūz, it is a story that is told primarily through drone video footage. If the first video was about the birth of Minneapolis as a flour milling center in the late 1800’s and the growth of a modern downtown during the 20th century, the updated story brings these threads current and shows how the city was again reborn in the early 21st century as a place not just for office workers but as a place to live and play as well. The story shows the central role that professional sports have played in this transformation, notably the construction of Target Field as the new home of the Minnesota Twins, the renovation of Target Center as the home of the Minnesota Timberwolves, and most recently of the construction of US Bank Stadium as the new home of the Minnesota Vikings as well as the venue chosen for Super Bowl LII. Told largely with aerial video taken by AirVūz licensed drone operators, the video shows, from an aerial perspective, how these world-class sports venues have led to a vast amount of new investment in residential buildings, retail and hotels in the areas surrounding the new venues. In creating this video, AirVūz was able to draw upon the extensive drone footage collection that AirVūz has created through various original programming content as well as through contract production work it has done for the Minnesota Vikings and other hometown teams. Thoroughly researched and professionally narrated, the video is intended to be both historically informative and visually entertaining. All drone footage used by AirVūz in this video was captured in strict accordance with Federal Aviation Administration regulations, by AirVūz drone pilots who are fully certified under FAA Section 107. AirVūz drone footage was supplemented by historical footage provided compliments of the Minnesota Historical Society as well as helicopter aerial footage provided by KARE-11 TV, the NBC affiliate for the Minneapolis/St. Paul metro area. VIDEO TRANSCRIPT: Speaker 1:	On February 4th 2018 hundreds of millions of eyes from around the world will be on the great northern city of Minneapolis, Minnesota. Minneapolis, paired with its neighbor St. Paul, is the center of a large metropolitan area often called the "Twin Cities", home to over 3 million people. The beating heart of this whole ecosystem is central Minneapolis. Within [00:00:30] a square-mile can be found a place where a mighty river was harnessed to produce flour for a hungry, growing nation in the 19th century. Where in the 20th century a major financial and business center emerged, which could twice boast of having the tallest building west of the Mississippi, and where early in the 21st century a new downtown, one not just for working but for living and playing, came into its own. It's a downtown which is now home to the second [00:01:00] largest retailer in the United States, which gave birth to the fourth largest bank in the country, and is home to its fifth largest bank. Downtown Minneapolis is where you can find the best known theater in the country west of the Hudson, and a top-tier music scene whose biggest star got started right here. It's a place where 160,000 people work every day, and tens of thousands now call home, and three world-class facilities for [00:01:30] basketball, baseball, and yes, football. None of this would be here but for the Mississippi River. The mighty water-way whose headwaters rise in northern Minnesota. The importance of the river to Minneapolis was the very power of the water moving through the falls. What Saint Anthony Falls provided, was a means to convert wheat into flour and on a scale far larger than had ever been constructed before. During the key Gilded Age decade of the 1880s, [00:02:00] it was the fastest growing city in the U.S. Minneapolis emerged as the flour milling capital of the world and became known as "Mill City". In the 20th century modern Minneapolis emerged out of the shadows of the milling district on the west bank of the Mississippi fed by many of the same elements that had driven the initial boom. The two leading milling companies became top branded food companies. In time, becoming General Mills and Pillsbury Company [00:02:30] respectively. The railroads, originally built to move grain in and flour out of Minneapolis, became themselves powerful drivers of the growing downtown. The power plants, which sprang up around the mills, morphed into large utility companies providing critical energy to light up a modern downtown. Utility companies were behind the construction of both the Rand Tower and Foshay Tower in 1929. The latter, [00:03:00] at the time, being the tallest building constructed west of the Mississippi. A retail trade sprang up in downtown Minneapolis. Most important to the future history of Minneapolis and the region, was a department store company called Dayton's, which opened on Nicollet Avenue in 1906. The importance of Dayton's to downtown Minneapolis became further evident in the late 1960s when Dayton's corporate parent, Dayton-Hudson, decided to locate its headquarters [00:03:30] to a 57-story skyscraper called the "IDS Center", which opened in 1973, eclipsing for the first time the Foshay Tower and also becoming, at the time opened, the tallest building west of the Mississippi. IDS Center was also integral to the construction of Nicollet Mall. It also serves as the hub of the Minneapolis Skyway System, the largest system of enclosed walkways in the world. Dayton-Hudson eventually shed its department stores to [00:04:00] focus on a chain of retail stores they call "Target". Target is now the largest employer in downtown Minneapolis. One of the banks, which originally financed the milling companies and their railroads, became Norwest Corporation, which acquired Wells Fargo and adopted the name and headquarters of the California bank. The other large Minneapolis bank became First Bank System, occupying a succession of headquarters buildings before being renamed "U.S. Bank" and moving [00:04:30] into its current headquarters building on Nicollet Mall in 2000. In the 21st century, Minneapolis entered a new golden age. In many ways one which is as exciting as earlier periods. This latest chapter in the history of this incredibly dynamic city can be summarized in two words, "pro sports". The Minneapolis Lakers were the NBA's first dynasty, winning five NBA titles from 1949 to 1954. Speaker 2:	[00:05:00] These are the Minneapolis Lakers, champion basketeers. Speaker 1:	They played most of their home games- Speaker 2:	At the new Armory in Minneapolis. Speaker 1:	Which was hardly an adequate venue for a team this good. Minneapolis couldn't provide the Lakers with a proper facility so they moved the franchise to Los Angeles. In an effort to bring professional baseball and football to the state, Metropolitan Stadium was constructed in a Minneapolis suburb called "Bloomington". The stadium paid off in 1961 [00:05:30] as the Minnesota Twins and Vikings came to town. Speaker 2:	Prosperity is back again. Speaker 1:	After a two-decade hiatus, Minneapolis was finally able to bring the Twins and Vikings downtown. The Hubert H. Humphrey Metrodome opened in 1982. Bloomington was left with an empty stadium and a plan to go with it. With their [00:06:00] eyes set on retail, they would demolish the Met and develop the largest mall in the United States with a fitting name to go with it, "The Mall of America". Minneapolis surrendered their retail to Bloomington for professional sports and for the most part it was a great decision. From 1987 to 1992, the Metrodome hosted two World Series championships, the NCAA Final Four, and Superbowl XXVI. Professional basketball [00:06:30] returned to Minneapolis in 1989 as the Timberwolves played their inaugural season in the Metrodome in front of an NBA all-time record setting crowd. The next season, a state-of-the-art arena opened across town and became the Timberwolves permanent home, the Target Center. The facility received an upgrade in 2004 and in 2017 Target Center received a total makeover and a $140 million renovation. A sum roughly triple [00:07:00] the original construction costs of the arena. The Timberwolves opened the 2017-2018 season in one of the most modern and well-equipped facilities in the NBA. When the new millennium arrived, the impressive Minneapolis skyline had just one flaw. The Metrodome was becoming an eyesore with a collapsing roof. In 2010 outdoor baseball came to Minneapolis with the construction of Target Field. In the early 21st century Target Center [00:07:30] and Target Field became the main drivers of a sustained boom in housing construction, which is resulted in the North Loop neighborhood of downtown becoming a major residential area. The Vikings vacated the Metrodome after the 2013 season. While the Metrodome underwent destruction, a totally different type of stadium was constructed in its place. U.S. Bank Stadium opened for the [00:08:00] 2016 season and instantly took the Vikings from what was universally regarded as the worst NFL stadium, to one of the best such facilities in the country, if not the best. Build at a cost of just over one billion or roughly 20 times the cost of the Metrodome constructed just three decades previously. Two years before it opened, the new facility was selected by the National Football League to be the site of its 52nd championship on February 4th 2018. [00:08:30] Along the way it has transformed this part of downtown. The development of U.S. Bank Stadium and the neighborhood around it, also represents something of a return by Minneapolis to its roots alongside the Mississippi Saint Anthony Falls. The stadium itself sits just a few hundred yards from the heart of the original milling district. As the proverbial "Center of the Universe" on Super Sunday, the stadium is the perfect vantage point for seeing the [00:09:00] wonderfully improbable story of this great city of the north.